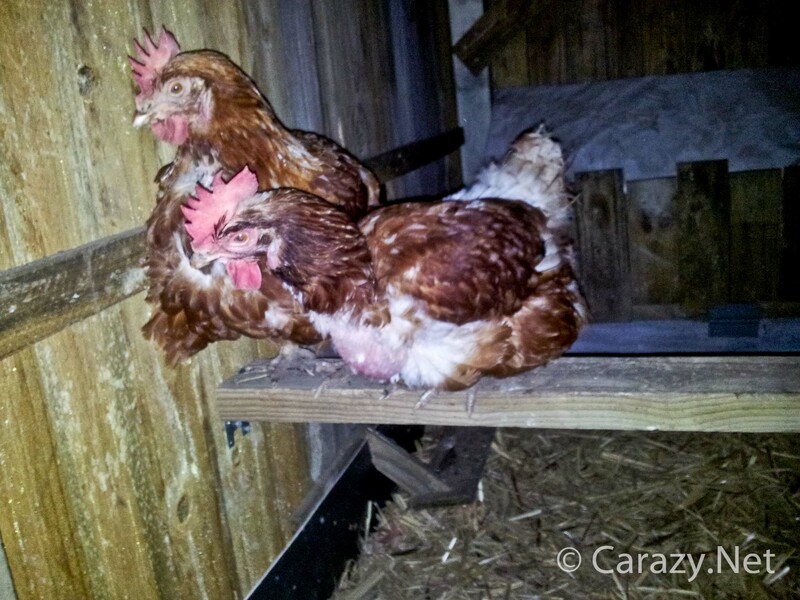 The girls and I are finally attempting to get up onto the roosting bar at night as our first port of call. The human has now spent over a month tucking us in each night. He stands there every night and watches us climb up the ramp to the roosting bar, assisting those that are having a few difficulties or give up and try to sleep on the ground. What he didn’t account for is that chickens think the end of the roosting bar near the wall is prime roosting real estate and thus the perpetual chicken roosting machine is created. Here’s how it works. The first ladychicken goes up the ramp and sits by the wall. 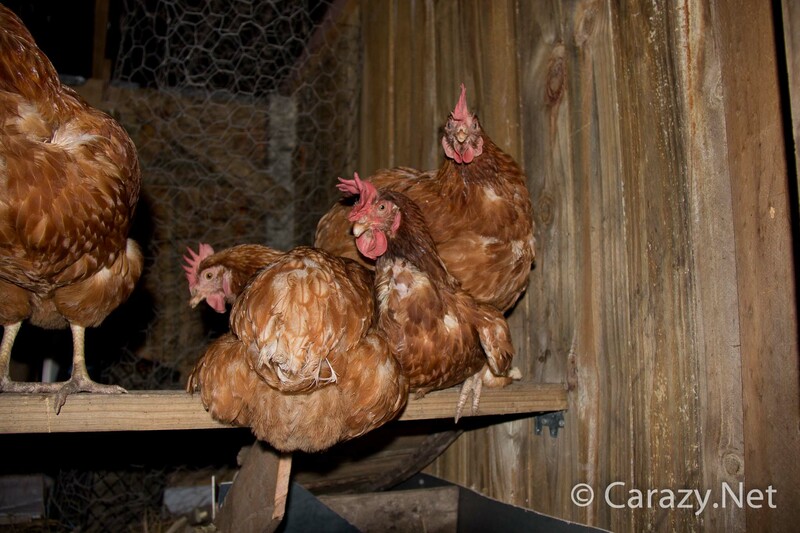 The second and third go up the ramp and sit beside her but don’t move along the roosting bar so when hens number four, five and six come up the ramp they simply try and squeeze in between the already squatting chickens. This results in one or more roosting chickens getting pushed off the roost. 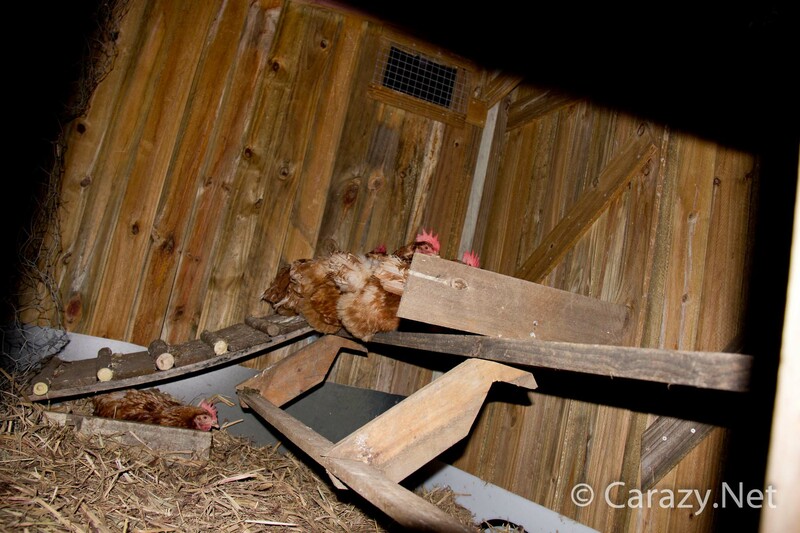 The intruding chicken sits down in the newly vacated spot and the fallen chickens make their way up the ramp and once again squeeze between the sitting chickens until one of them falls off. This will repeat indefinitely until one of the fallen ladies decides to just squat down on the floor and sleep there. Here’s a picture showing the endless loop. This however isn’t part of the human’s plan for us and continues every night despite the additional step he put along the whole length of the roosting bar so that we can feasibly jump onto any point of the roosting bar with ease. Obviously we choose not to. 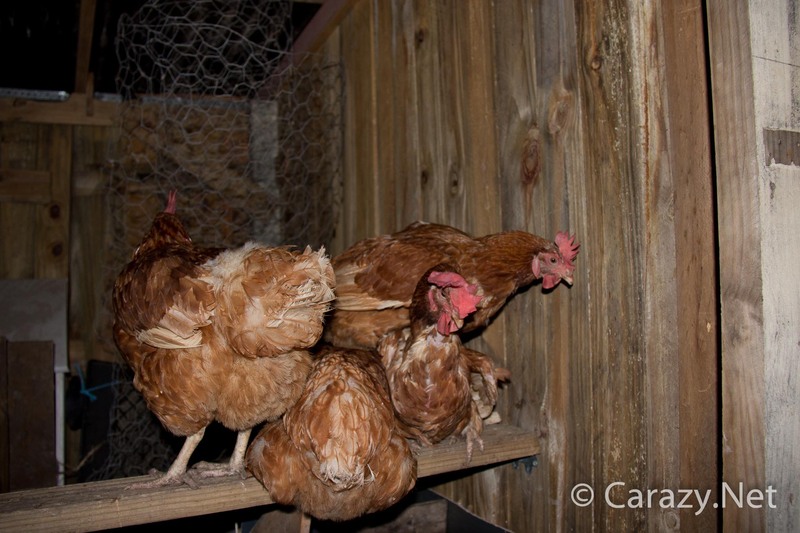 The girls are determined to be near the ramp and wall to the point where we now form what the human calls the chicken pyramid. Whoever gets to the roosting bar first buckles in and tries to hold their ground. 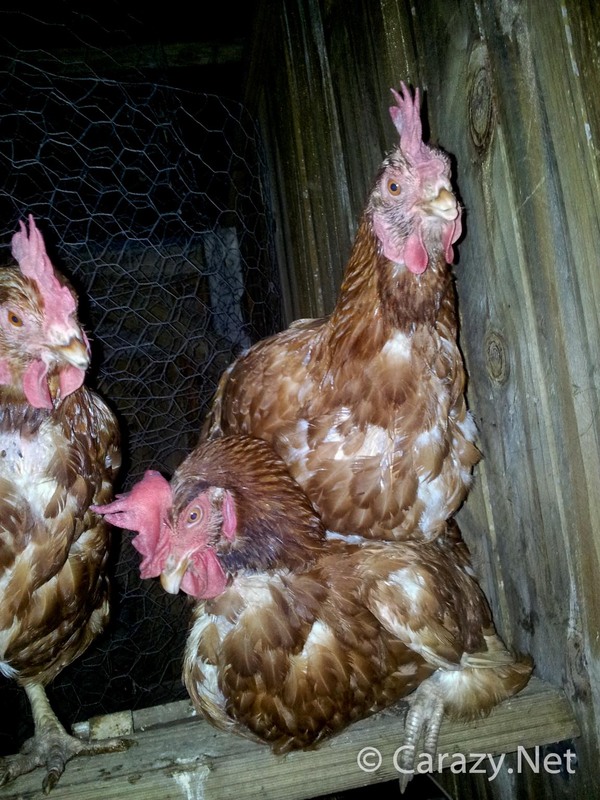 The incoming ladychickens however take this challenge beak on and just squat on the sitting chickens. Given that our balance has been improving over the weeks with all of Treatgod’s training this stacking effect at times can almost get to three chickens high! At this point we have achieved chicken pyramid status but it’s short lived as several of us tumble to the floor flapping frantically. Lucky for us the human has made the floor a 30cm (1 ft) thick layer of puffy sugar cane mulch so there’s no injuries other than pride. You can see in this photo from the last diary entry the additional step up bar the human built for us along the whole roosting bar as a ramp alternative. He even put an upright piece of wood to simulate a wall half way along the roosting bar thinking one of us would opt to roost up against it. Silly human! This is what a chicken sitting on another chicken looks like. Now imagine with three chickens at the bottom and two on top them what a third level of chicken would look like and that’s what we almost achieved except one of the stunt chickens at the bottom couldn’t hold it together! The next photo is the first phase of building the chicken pyramid. 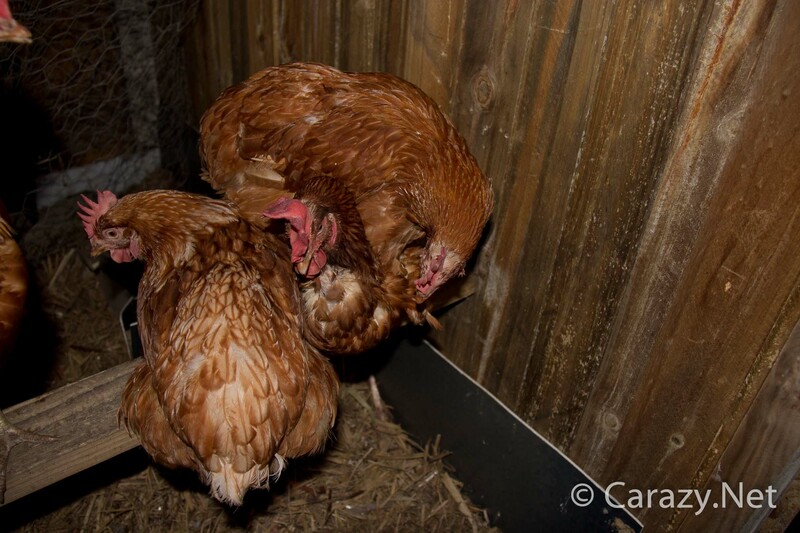 The hen resting near the wall has just realised that someone has just climbed on her back. She is not amused. The climbing hen is checking her foundation chicken is okay and stable. We now have two layers of ladychicken! 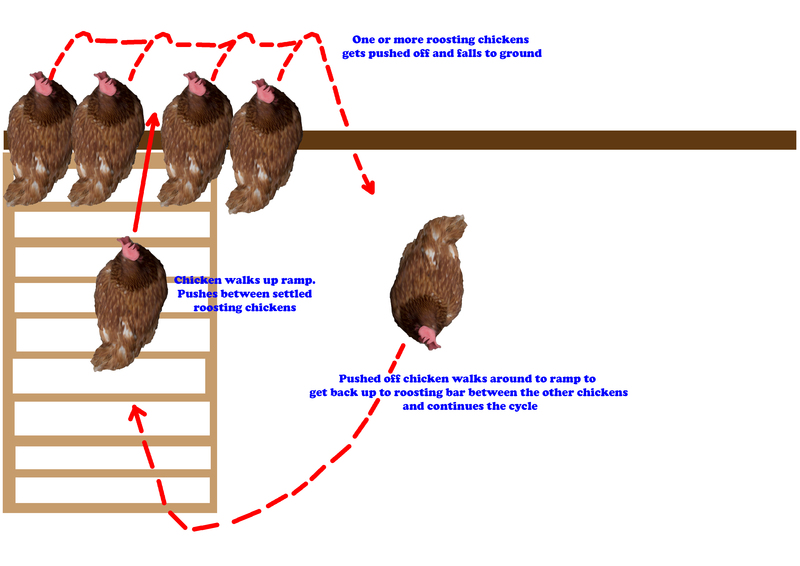 Bear in mind there are another two hens on the ground making their way to the ramp and will ultimately add themselves to the formation of the chicken pyramid. Unfortunately our three layer chicken pyramid was all too brief and our tired human wasn’t quick enough with the camera, so with no photo it will have to remain in the realm of chicken mythology. The human eventually had a little win with two of the smartest chickens realising that there’s another full sized wall at the other end of the roosting bar. That’s me on the right ! This going to sleep thing is exhausting. Who would have thought bedtime could be so tiring!